This painting is a bit of a departure for me in terms of subject matter, as I usually paint objects or people of Technology. I had so much fun painting the classical Steve Jobs portrait, that I wanted to explore this more. I am an admirer of Elvgren's work. Gil Elvgren was an American painter most famous for his pin-up girls. His use of light and colour is phenomenal, and I love the innocence and playfullness of his work, and the cheesy way his subjects often react to situations or objects. They say the best way to improve one's art skills is to copy the Masters. 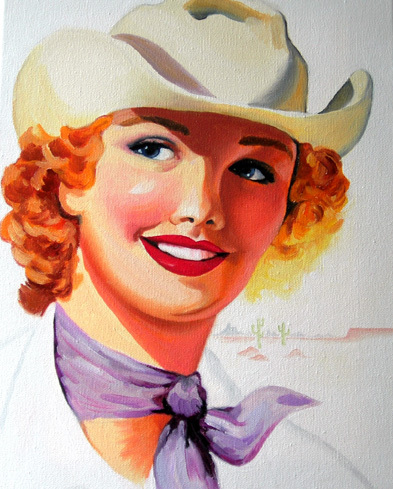 "CowGirl" is my take on one of his early advertising images. 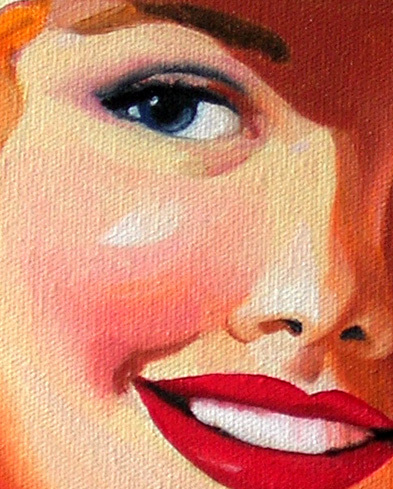 There's something about the cute redhead and her creamy colours, and the way the light plays on her features, that makes her a really fun painting to look at. She is primarily inspired by Elvgren, but I added my own touches to this painting, such as the desert background and suggestions of her jacket. I do hope you enjoy this painting as much as I do, as she is a pleasure to admire.